WITH the growing use of radioactive materials in many laboratories, the matter of radiological protection for lab personnel is taking on extra emphasis. Traditional metal enclosures – often made of lead – are certainly effective but present a small risk of toxicity and make it difficult to verify contents without opening them. This, of course, removes their radiation protection. Cleaver Scientific’s updated range of see-through acrylic radiation shielding containers solves these problems by offering effective protection against beta and gamma radiation. The range includes boxes, cabinets, bins, racks, and spillage trays. Standard 10mm thick shields provide effective protection against beta radiation, while 12mm lead-impregnated products are offer greater shielding against gamma radiation. For more serious protection, 35mm thick lead impregnated sheet provides gamma attenuation equivalent to 1.5mm thick solid lead – and this can be doubled to 70mm shielding, equivalent to 3mm lead. The company also makes products specifically designed for both beta- and gamma-ptotection, called Duoshield. 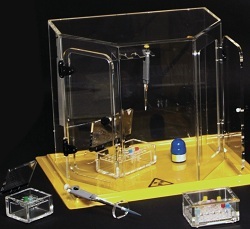 Cleaver offers custom-made shields and containers to suit practically any specific radiation protection need. Storage boxes can hold any type of container, from micro-centrifuge tubes to scintillation vials. Heavy-duty drawstring waste bags are available, and free standing bench top bins with hinged lids suit the short term storage of radioactive materials.